This is a video lesson based around the video “Mr. Bean packs his suitcase” thanks to British Council for bringing it to my attention in their lesson plan on making predictions but I’ve adapted it for use in different ways with different levels. The aim of this lesson plan is to practice holiday vocabulary (clothes and items that go in a suitcase) and some basic grammar structure. You could also use this quizlet set to go over clothes vocabulary. Ask students: What do you have to do before you go on holiday? Buy your ticket, pack your suitcase, find your passport etc. Put students in pairs and arrange them so that 1 is facing the screen and one has their back to the screen. Tell them that the one facing the screen is going to watch 20 seconds of the video then describe it to their partner, their partner will then repeat back what they’ve heard to make sure they have understood. Students then change positions and repeat until minute 3:14. Then let all students watch the end together. Alternatively students could come up with predictions for how the video will end. I recommend pausing the video quite frequently so that students can concentrate on describing 2 or three actions accurately rather than trying to describe a big chunk of the video. Then replay the whole video from the start so that everyone can watch it together, ask students if they think their partner described the action well. Thanks a lot. I am really looking forward to using this lesson plan with my first year learners of English. 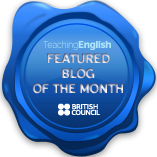 Just to let you know that we’ve shortlisted this blog post for this month’s TeachingEnglish blog award and I’ll be making a post about it on Thursday’s TeachingEnglish Facebook page http://www.facebook.com/TeachingEnglish.BritishCouncil, if you’d like to check there for likes and comments. Thanks for the idea! My children of year 5 and 6 really love it. They are really enthusiastic of watching Mr Bean videos. Great lesson. Worked really well with my 11 year old pre-Int student. Many thanks! You’re very welcome. Glad to hear it.